The Savic Nestor Corner Cat Litter Box is a handy, space-saving alternative to traditional rectangular litter boxes, as it fits into the corner of a room. The opening, including the swing door, can be flipped up for easy acceΒ inside the litter tray, allowing you to clean in all of the corners, without removing the cover completely. The cover can be lifted off when needed, so that you can empty the cat litter box and give it a thorough clean. Once cleaning is complete, you can re-attach the cover using the three clips. 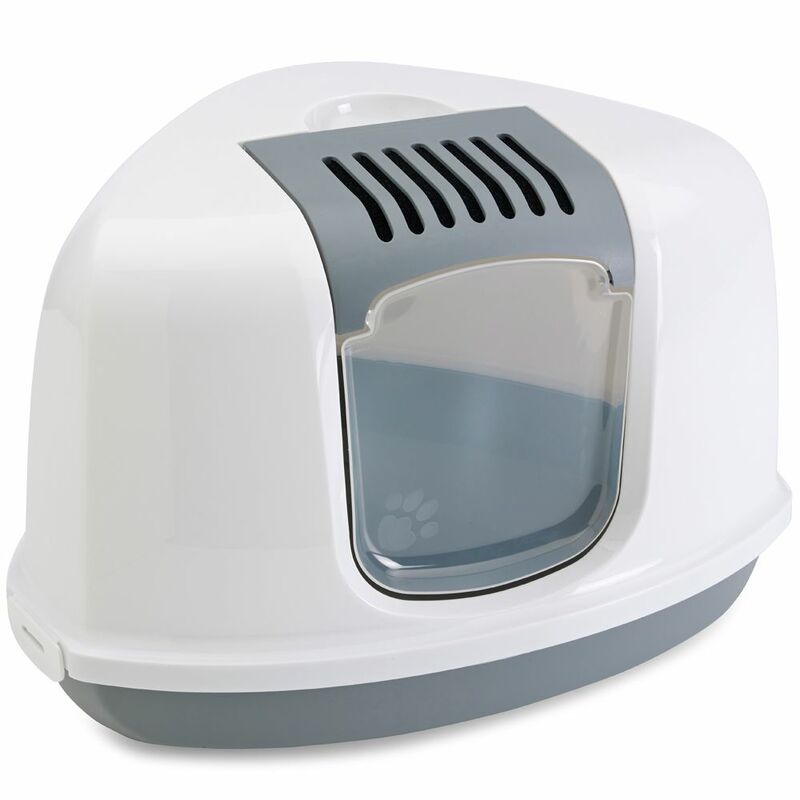 The cat litter box has a swing-door with a little paw-print design through which your cat can acceΒ the box. The included carbon filter is inserted into the hood and ensures that no nasty smells escape. The filter should be changed at regular intervals to keep the air in your rooms fresh. The Savic Nestor Corner Cat Litter Box is ideal for anxious or nervous cats and timid kittens that are not used to using a covered toilet yet. You can leave the hood flipped up to begin with, until your pet is accustomed the new litter tray. The high base tray can also be used without the cover. The covered corner litter box has a moulded grip at the top to make it easy to move, and is available in either white and grey or white and fuchsia pink. The Savic Nestor Corner Cat Litter Box at a glance: Triangular covered cat litter box Space-saving corner tray: fits in the corner of the room Large opening – ideal for cleaning: the front door folds up and away, for easy acceΒ to the litter Removable cover: for changing the litter, with integrated clips to attach to the base tray Changeable carbon filter: filters unpleasant odours Practical integrated handle in the lid: makes the box easy to move and carry Swing door made from transparent plastic: removable with paw-print detail for cats that like a private litter box keeps unpleasant odours inside the box Made in Belgium Colour: white, light grey Dimensions: Total dimensions: 58. 5 x 45.5 x 40 cm (L x W x H) Swing door: approx. 19.5 x 23 cm Entrance: 20.5 x 23.5 cm (L x H) Area of opening for cleaning when swing door folded open: approx. 20.5 x 29 cm Base height: 11.5cm (L x W) Entry height: 13cm (L x W x H) Sizing for Savic Bag it Up Litter Tray Bags - Maxi: Suitable for trays up to: 55 x 43 cm (L x W) Contents: 12 bags More information about Savic Bag it Up Litter Tray Bags can be found here: Savic Bag it Up Litter Tray Bags.